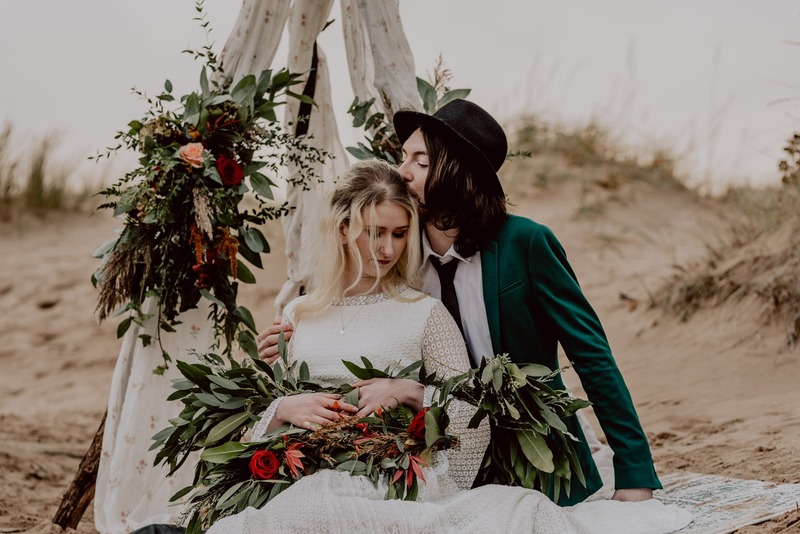 Back in November, I had the opportunity to do wedding hair and makeup for a styled wedding shoot with Louise Griffin Photography, Flamingo Boulevard Bridal Salon, and La Beau Fleurs floristry. Lou decided to do a winter beach shoot in the dunes of Crosby Beach, which gave us a gorgeous backdrop and beautiful moody skies. There was also a super cool graffiti wall too! It was freezing, but we had a wonderful time, and the images Louise captured were absolutely stunning. I used deep, rich berry shades on the eyes and lips to compliment the sumptuous colour palette of the flowers and the grooms velvet jackets. I love these type of colours for a winter bride, they look so indulgent and glamorous. Plus they made our “bride” Victoria’s blue eyes shine! La Beau Fleurs brought some amazing creations along. I loved her boho styled teepee accentuated with flowers and fairy lights. The absolute showstopper was the stunning greenery garland for the bride to drape across her arms in lieu of a traditional bouquet. Super cool! Rachel also made a wild bouquet that was breathtaking. Flamingo Boulevard Bridal Salon always has super chic and stylish bridalwear. Jazmin brought along some gorgeous gowns by Island Tribe, all crochet lace and bell sleeves. They were perfect for the relaxed, boho vibe we were creating. She also made this fabulous fringed veil, isn’t it romantic? Louise Griffin Photography is a wonderful photographer that makes her photos look effortless! She really knows how to capture special moments with a natural flare. I love the intimacy of her photos, you can feel the love pouring out of them! She really captures the feelings as well as the moment. I hope you love these pics as much as I do, and I hope they might give you some inspiration too! It’s always nice to do styled shoots because we can create some inspiring and aspirational images for couples. If you are looking for wedding makeup and hair in Liverpool that suits your personality and style, then I’m the MUA for you! I pride myself in tailoring my artistry to suit each individual bride, natural, glam, or somewhere in between. Get in touch for a copy of my digital wedding brochure. I still have 2019 dates available, and am booking 2020 weddings now. If you are a wedding supplier who has done a fab shoot or real wedding that you would like to share, get in touch with us for more information on submitting to the blog!